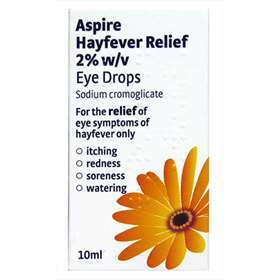 Aspire Hayfever Relief Eye Drops provides relief from itching, red, sore and/or watering eyes which is caused by hay fever. Relief from itching, red, sore and/or watering eyes. Squeeze 1 to 2 drops into each eye four times a day. Once open discard after 28 days. Only for Adults and children over 6 years old. See a medical processional if there is no improvement for 2 day or you use for 14 days in a row. Consult your doctor or pharmacist before use if you're pregnant or brest-feeding. Do not use while wearing soft contact lenses. Sodium cromoglicate, Benzalkonium chloride, Disodium edetate, Water for injections.